Suburbs of Jasper: Boone, Hall, Kimball International, Kimball Intl, Portersville. Jasper is also known as: Dubois County / Jasper city. Their current mayor is Mayor Terry R. Seitz. Zip codes in the city: 47546, 47547, 47549. Some of the notable people born here have been: Brad Ellsworth (politician and sheriff), Scott Rolen (baseball player), and Matt Mauck (american football player). Jasper is a city in Dubois County, Indiana, United States located along the Patoka River. The population was 15,038 at the 2010 census making it the 55th largest city in Indiana. 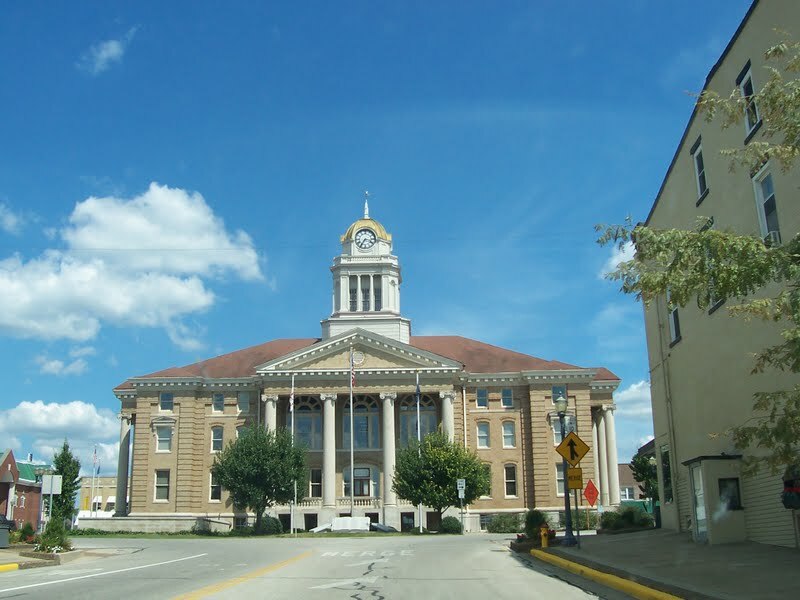 Jasper has been the county seat of Dubois County since 1830, succeeding Portersville. On November 4, 2007, Dubois County returned to the Eastern Time Zone, after having moved to the Central Time Zone the previous year. The land uses are mainly agriculture.Jasper is a regional center in Southwestern Indiana, noted for its heavily German Catholic ancestral roots. Jasper has often been called the "Wood Capital of the World", boasting a large number of furniture companies, including Kimball International and Masterbrand Cabinets. Jasper is also home to the Southern Indiana Education Center (SIEC), Jasper Engines & Transmissions (largest re-manufacturer in the market), and to a satellite campus of Vincennes University.The Indiana Baseball Hall of Fame, which honors players and others associated with the national pastime who were born or lived in Indiana, is located in Jasper.Jasper also boasts the only municipally supported Arts Council in the state of Indiana; it is part of city government and is supported by the city for its citizens in the same vein as its park board or its street department. The city of Jasper and the Jasper Community Arts Commission have won the Governor's Arts Award twice, once in 1987 and again in 2007, and it is the only group to have garnered this award twice. It was revealed on March 23rd, 2019 that Dominick D'Ambrosio passed on in Jasper, Indiana. D'Ambrosio was 96 years old and was born in Kayford, WV. Send flowers to share your condolences and honor Dominick's life. It was written on February 28th, 2018 that Allan Frederick Harris died in Jasper, Indiana. Harris was 76 years old and was born in Chicago, IL. Send flowers to express your sorrow and honor Allan Frederick's life. It was written by Orlando Sentinel on April 1st, 2017 that Gloria Toole passed away in Florida. Toole was 88 years old and was born in Jasper, IN. Send flowers to express your sorrow and honor Gloria's life. It was written by Waterloo/Cedar Falls Courier on August 24th, 2016 that Paul Rev "Al" Huffman perished in Waterloo, Iowa. Huffman was 89 years old and was born in Jasper, IN. Send flowers to express your sorrow and honor Paul Rev "Al"'s life. It was noted by Tampa Tribune on September 4th, 2014 that Kenneth Lee Knabel passed away in Avon Park, Florida. Knabel was 77 years old and was born in Jasper, IN. Send flowers to express your sorrow and honor Kenneth Lee's life. It was revealed by Middletown Journal on September 27th, 2013 that Thomas Ray Brown died in Monroe, Ohio. Brown was 55 years old and was born in Jasper, IN. Send flowers to share your condolences and honor Thomas Ray's life. It was reported by Cincinnati Enquirer and Cincinnati Post on September 18th, 2013 that Andrew Jacob Hoffman died in Cincinnati, Ohio. Hoffman was 84 years old and was born in Jasper, IN. Send flowers to share your condolences and honor Andrew Jacob's life. It was reported on August 27th, 2013 that Dennis W Luchini passed away in Jasper, Indiana. Luchini was 70 years old and was born in St Louis, MO. Send flowers to express your sympathy and honor Dennis W's life. It was written on August 22nd, 2013 that Linda Lee Dixon (Renaud) passed away in Jasper, Indiana. Ms. Dixon was 69 years old and was born in Des Moines, IA. Send flowers to express your sorrow and honor Linda Lee's life. It was revealed by Williamsport Sun-Gazette on January 24th, 2013 that Clyde P Buchta perished in Williamsport, Pennsylvania. Buchta was 85 years old and was born in Jasper, IN. Send flowers to express your sympathy and honor Clyde P's life. In 1970 the school system of Ireland, a hamlet west of Jasper along State Route 56, was consolidated into that of Jasper [http://www.irelandindiana.com/ ]. The population was 12,100 at the 2000 census. The city has been the county seat of Dubois County, Indiana County , since 1830, succeeding Portersville. Jasper is a city in Dubois County, Indiana County, Indiana, United States. On November 4, 2007, Dubois County returned to the Eastern Time Zone, after having moved to the Central Time Zone the previous year.The land uses are mainly agriculture. The official website for the city of Jasper is http://www.jasperindiana.gov. Listing all funeral homes in Jasper, Indiana so you can easily send flowers to any location (same day delivery) or find any funeral service. Funerals in Jasper, AL on Yahoo! Local Get Ratings & Reviews on Funerals with Photos, Maps, Driving Directions and more.